Pasadena artist Roger Hayward created one of the true treasures of Los Angeles, and practically no one knows it! Hayward was a scientific illustrator, model maker, and "jack-of-all-trades" employed at the Griffith Observatory during the 1930s and 40s, and built some of its finest exhibits. 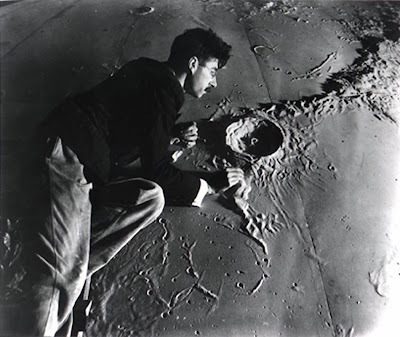 In the 1934 photo above, Hayward is sculpting an enormous "slice" of moon surface some 80' in diameter. The model is no longer on display, and I would love to know whatever happened to it. 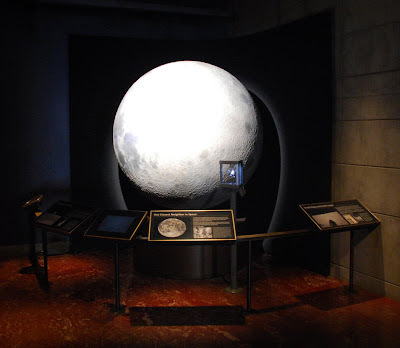 His smaller 6' complete moons can still be seen today, however, at the L.A. Griffith Observatory and at the Adler Planetarium in Chicago. Oddly there is no credit given to Hayward at Griffith's display, which I think is a shame. 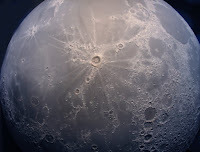 Apart from the accuracy of mapping out the moon's real features, Hayward's model is an historic treasure in itself, and a major attraction at the Observatory since the very beginning. And besides, this moon is a star! 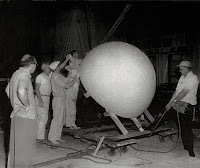 Used in several film productions, including this fantastic segment from Ward Kimball's "Man In Space" TV series for Walt Disney in 1955.